Nashville, Tenn. -- The Fred Thompson testing the waters committee announced that it launched an upgrade and redesign of its website www.imwithfred.com today. The website will allow Americans to show their support for a potential Fred Thompson presidential bid as he continues to travel the country. The Friends of Fred Thompson committee has been a leader in using interactive tools to communicate with a fast-growing list of friends and supporters. The new website will build on those tools to create a community of Americans who share Thompson’s vision for America. The newly revised action center creates more tools for web visitors to show their support for Thompson—tools such as organizing local community events, voter registration information, and ways to share information with friends and supporters. The website also has a “FredCast” section that will let visitors experience Thompson’s public events and messages. In “Principles,” supporters will be able to hear Thompson speak on a range of issues that make up the core principles that are the foundation of our country. Thompson is enjoying a broad base of support all across the country. This website will allow even more Americans to learn about his experience and his values and sign up to join this dynamic and groundbreaking effort to urge Thompson to run for president. Welcome to ImWithFred.com – Version 2.0. As Fred is testing the waters, this site will be our resource for news, information, and ways to let him, and our friends, hear from us about a potential Fred Thompson candidacy. For the past few weeks, we’ve used the tools on this site to recruit friends and share our thoughts about Fred. Now the site gives us greater capabilities. 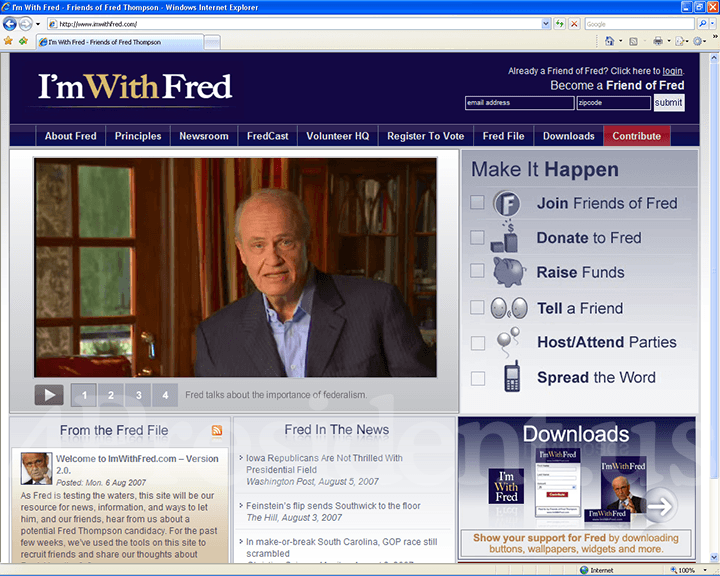 Beginning with our homepage, this site will now be your resource for Fred Thompson news and information, and to hear from Fred about the issues we face as a nation..
With the newly revised action center, we have even more ways to show Fred we think he’s the right man for the job. There are tools we’ve already been using – contribution and communications widgets for other web sites and blogs to utilize, to e-mails notifications for friends, and new tools, like options for organizing events in our communities, registering to vote, and making sure our friends are registered to vote, too. We’ve even added a networking tool that will allow you to track - through your profile page - how successful you’ve been in recruiting Friends of Fred and building support for him. Through the FredCast section we put you on site wherever Fred might be speaking from the road. In Principles, we can see and hear Fred speaking on a range of issues and the broad concepts that form the foundation of America and the values we share. This site is all about continuing the national dialogue Fred started a few months ago, and doing it together. We hope you come back often and bring along a few new Friends of Fred each time.